If there's an eventual downside to the rising smartphone phenomenon, it's not in sight. The worldwide smartphone market reached yet another key milestone, having shipped one billion units in a single year for the first time. According to the latest global market study by International Data Corporation (IDC), vendors shipped a total of 1,004.2 million smartphones worldwide -- that's up 38.4 percent from the 725.3 million units in 2012. This aligns with IDC's most recent forecast prediction of 1,010.4 million units, making for a difference of less than 1 percent. Smartphones accounted for 55.1 percent of all mobile phone shipments in 2013, up from the 41.7 percent of all mobile phone shipments in 2012. 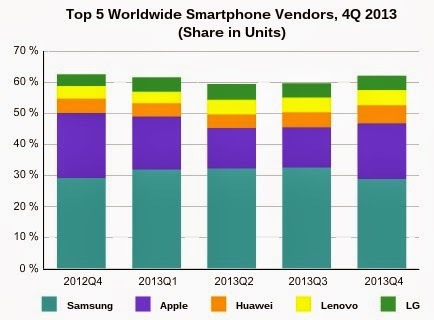 In the fourth quarter of 2013 (4Q13), vendors shipped a total of 284.4 million smartphones worldwide, up 24.2 percent from the 229.0 million units shipped in 4Q12. In the worldwide mobile phone market (inclusive of smartphones), vendors shipped 1,821.8 million units, up 4.8 percent from the 1,738.1 million units shipped 2012. In 4Q13 alone, vendors shipped a total of 488.4 million units worldwide, up 0.9 percent from the 484.0 million units shipped in 4Q12. This is 2.8 percent lower than the 502.4 million units that IDC had recently forecast. "The sheer volume and strong growth attest to the smartphone's continued popularity in 2013," says Ramon Llamas, research manager at IDC. Total smartphone shipments reached 494.4 million units worldwide in 2011, and IDC believes that doubling this prior volume in just two years demonstrates strong end-user demand and vendor strategies to highlight smartphones. Among the top trends driving smartphone growth are large screen devices and low cost. Inexpensive devices are not the attractive segment that normally grabs attention, but IDC data shows this is the portion of the market that is driving volume growth. Markets like China and India are quickly moving toward a point where sub-$150 smartphones are the majority of shipments, bringing a solid computing experience to the hands of many. That mainstream adoption translates into millions of potential new users of the mobile internet -- all capable of active participation in the Global Networked Economy. The implications could be very significant to the leadership of these developing nations.